“Everything is better with bunnies,” my friend Kris wrote to me in an e-mail yesterday. I had to chuckle over her comment. Indeed, the bunnies have made this week a better one for me. I’m still completely benched from my “shop.” Frankly, I can’t even call it a shop anymore. Now it’s once again just an empty storefront awaiting a gut job and then new ceiling, walls and floor… with an optimistic estimate of three more months to completion… sigh. But I don’t want to dwell on what I can’t control. So I find myself playing a whole lot more with my kids, force feeding the rest of my inventory to my poor little closets at home and making bunnies. It started with “Rustic Bunny.” Knit up by my friend, Edita, who found the tutorial for it online (thank you to Jo So & Sew!). We’d intended to use this pattern with our beginner knitting students. But alas, weren’t able to due to fire/flood calamity and ensuing closing of space. 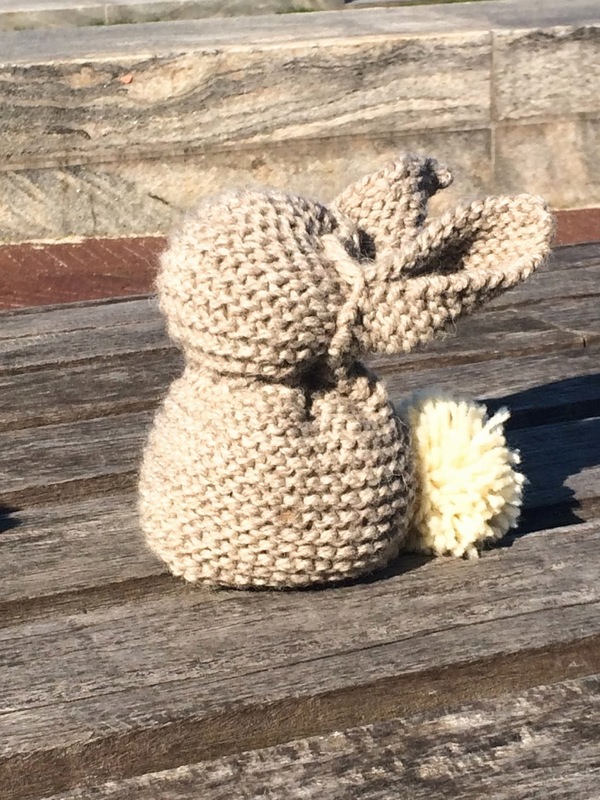 We loved the idea that a the simple garter stitch square could be transformed into an adorable bunny. A clever project that a beginner knitter could complete in a reasonable amount of time. Edita’s bunny turned out so cute, I decided to make one as well. My first attempt was “Big Bunny” (with brown tail) leading the line up. Then I decided to try again with a crocheted square instead. My second attempt was “Gremlin” – named for his funny crinkled gremlin ears. He’s the guy in the middle with the grey tail and crooked ears. Using a crocheted square works too. Just be warned that the single crocheted fabric ends up stiffer than the knitted garter stitch square. The ears are harder to shape properly. You know me, right? Slightly obsessive. I wasn’t happy with Gremlin’s messed up ears. I had to try the crocheted square bunny again. Third attempt is named “Brown Bunny.” I like him best. My son does too and has already claimed him as part of his Easter present. Everything really is better with bunnies. When I was in third grade, my dad took us to live in Honolulu for six months of his sabbatical. On that first day of school, I showed up to school with my hair neatly pulled back in a french braid, wearing a pretty blue and red homemade wrap skirt and little wedge leather sandals. Fast forward a few months. I still wore my hair braided back – but that was so I didn’t have to comb it between trips to the swimming pool. I lived in cut-off shorts and flip flops. The flip flops stayed on only til I got to school and then I kicked them off at the classroom door and traipsed around barefoot in class with all my classmates. Funny, the things we remember about being 9 years old. The other memory that stands out in my mind is how much I loved reading the Laura Ingalls Wilder “Little House” series. I couldn’t get enough of these stories. I read them cover to cover, one after the other. When I finished the series, I’d simply start the whole thing over again. I recall poring over the books while my parents “dragged” us about Hawaii to see the sights. There’s even one family picture where I’m clearly more interested in displaying my copy of “These Happy Golden Years” than in the fact that we were practically living in paradise! And now, once again, we are reading these wonderful books. I actually read the first six books in this series to my boys about 5 years ago when Si was in first grade and E in pre-K.
Then Si read those same six books for himself when he was in third grade. And then history repeated itself one more time this year when E, now in third grade, developed a passion for this series. 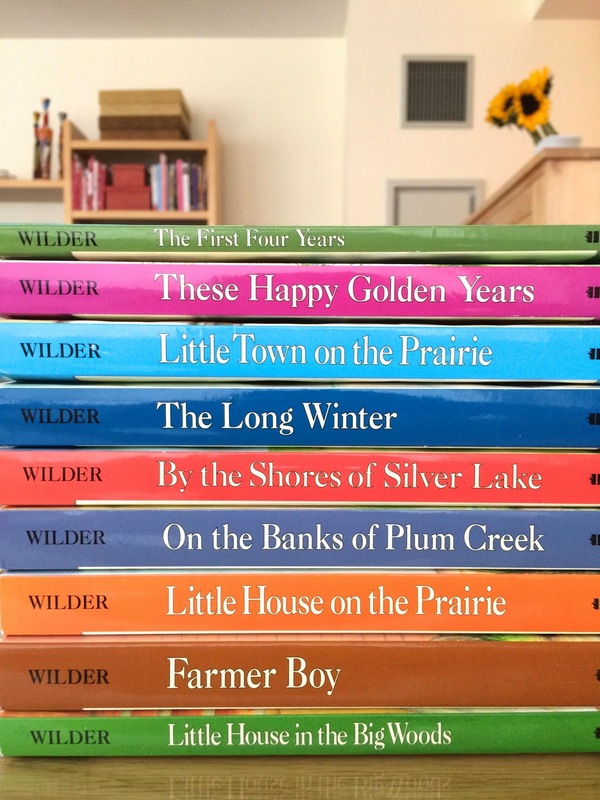 So much so that after he finished the entire series he talked endlessly about all the details and quizzed us over “Little House Trivia.” When it came time for E to pick the next read-aloud, he demanded we read these books again. Si & I griped a little at first. We lobbied for E to choose something new to all of us. But E stayed firm on his choice. I shouldn’t have worried about being bored over a repeat read-aloud. Turns out we all love these stories just as much as ever. 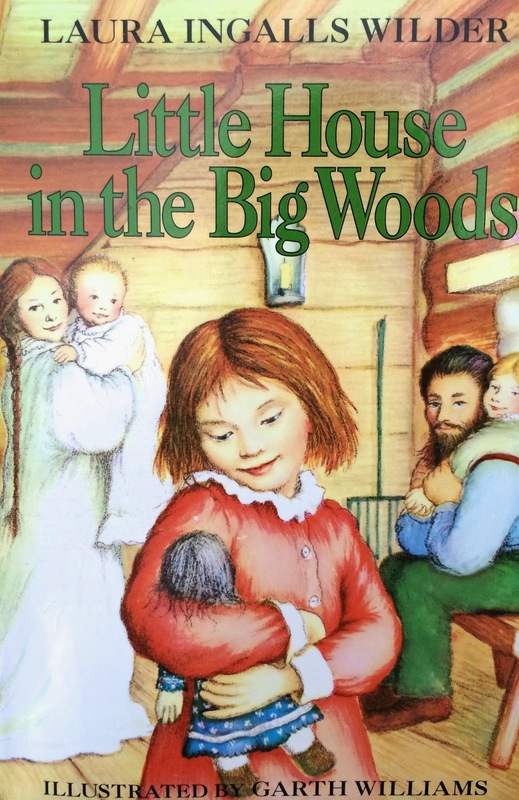 We polished off “Little House in the Big Woods” in under a week. 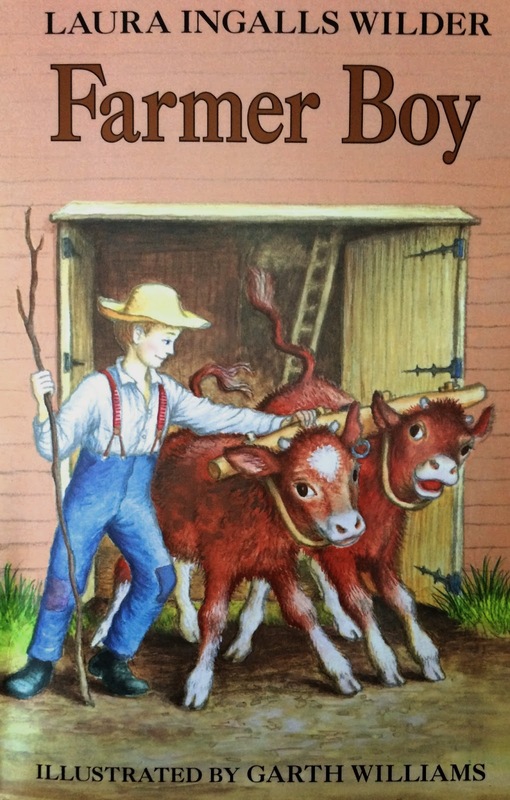 We’re already three-quarters of the way through “Farmer Boy.” Our favorite parts of both books? All the descriptions of the food. Making maple sugar. An attic packed with pumpkins, squashes and onions. Frying up the pig tail. Churning butter. Making ice cream. Stacked pancakes. Apple and onions. Boiling candy. How much food can that Almanzo eat anyway? Baking bread. Smoking meat. The corn dish that took Ma three days to prepare. Bacon. Fried trout. I’m telling you, the food parts of these books are what we find especially mouth-wateringly fascinating. Of course, we like Laura and Almanzo a whole lot too. We think Mary and Eliza Jane just a little too “goody.” We had a good laugh over Ma accidentally slapping a bear. We got a little nervous when Almanzo almost fell in the ice. In short, we’re having a marvelous time experiencing these books one more time. 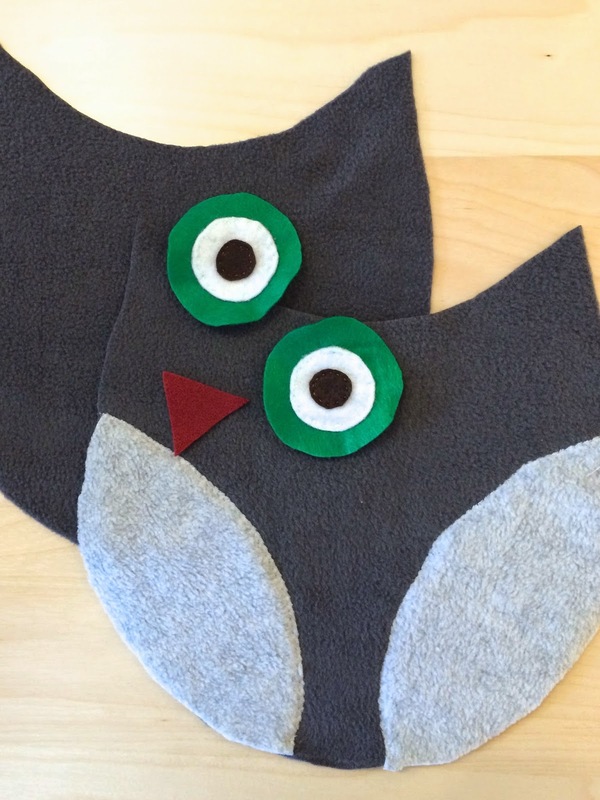 It was a good choice, E.
Stuffed owls made from fleece and felt. One of the projects my kid students and I were working on right before my studio was derailed by that unfortunate night of the fire/sprinkler incident. This simple plushie was project #2 for my very beginner sewing students. Project #1 (small square pillow with hand embroidered embellishments) was designed so students would practice machine sewing straight lines on cotton fabric. 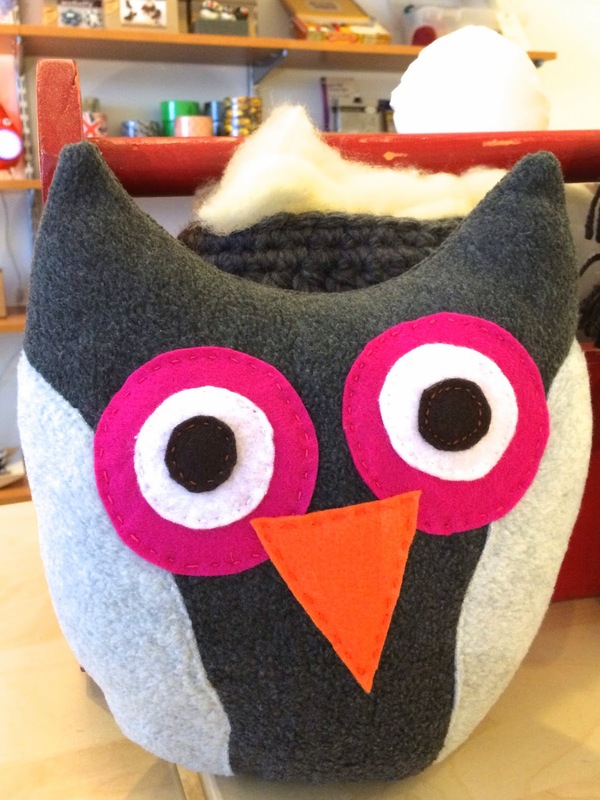 Project #2 upped the ante a little by requiring them to sew a curved line with the machine and, in the case of this owl, work with the slightly stretchy fleece. Body: To make the pattern, place a round plate or lid on a piece of paper and trace a semicircle. Extend the sides to form a U shape. Draw shallow curve to form the top of the head. Add a quarter inch to all curves to account for a quarter inch seam allowance. Pin paper pattern to fleece. Cut 2 to form the front and back of the body. Wings: Cut 2 “football” shapes from contrasting fleece to form the wings. Eyes: Cut 3 sets of circles (small, medium and large) out of acrylic felt. 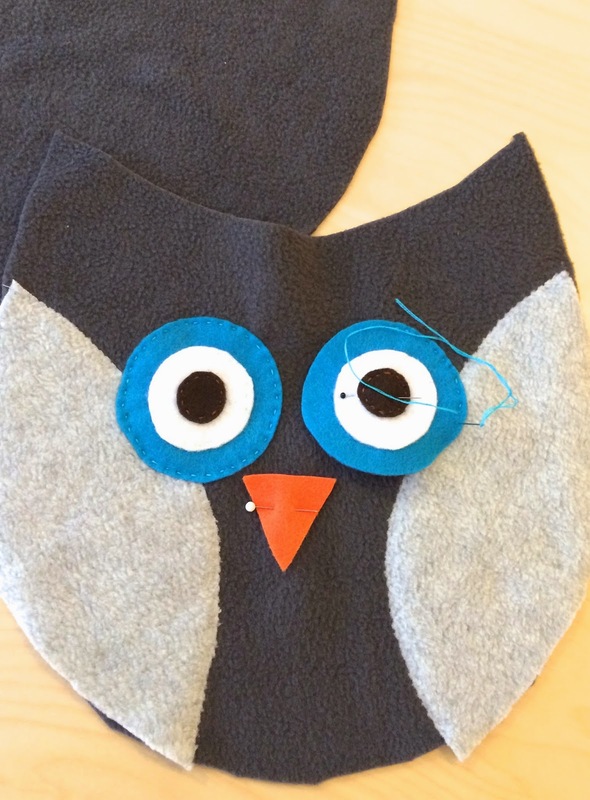 Beak: Cut 1 triangle to form the owl’s beak. Why felt? Anyone hanging out with me this past year may have noticed I used a whole lot of acrylic felt when sewing & making crafts with my kid students. The great thing about working with felt is that we don’t have to worry about fraying edges or grain lines. But the drawback is that acrylic felt will start to look worn very quickly if handled too much. 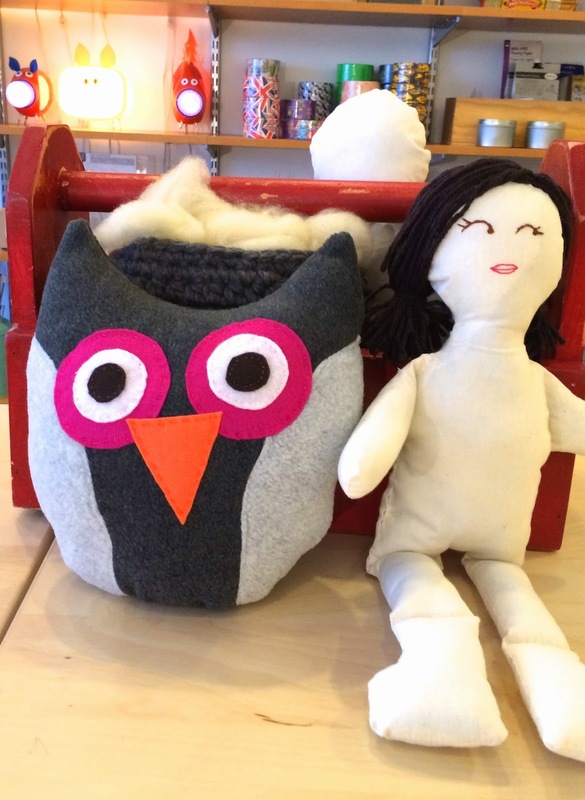 Hence the decision to use a more resilient fabric for the owl body and the felt for embellishment. First attach wings to front of body using a zigzag stitch on the interior curve of each wing (i.e., the curve that is not along the edge of the body). Hand sew the 3 layers on each eye together using embroidery floss. Your choice of color – do you want the stitching to blend in at each layer or do you want the floss color to pop? Hand sew the eyes to front of body. Again, I use embroidery floss here because I prefer the decorative look of it. Hand sew beak to front of body. Pin front and back of body together with right sides facing in. Sew around perimeter of body leaving an opening at the bottom. I prefer to sew with a quarter inch seam allowance. I leave @2-3 inches open at at the bottom (between the ends of the wings). Pin opening and whip stitch closed. And there he is – a super cute and super cuddly owl. Sitting next to his doll-buddy friend (more on her in upcoming blog posts).